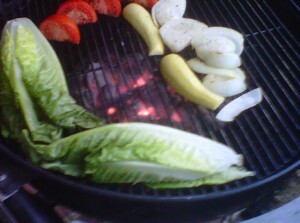 Ever grilled Romaine lettuce? 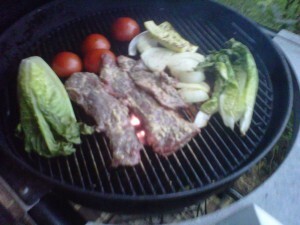 It’s quite delicious and gives me one more reason to light up the grill and cook outside. Plus I had some white truffle oil that I was dying to try. Like Truffle Oil? Try this one from Degredient. Now I know all about Gordon Ramsay fussing about crappy truffle oils being nothing more than cheap perfume and believe me I’ve had plenty of overly powerful truffle oils but I really like this one, it doesn’t knock you over with forced mushroom aromas. Read more about it on their website. And in no time I had a very nice Sunday Supper for me and Amy. 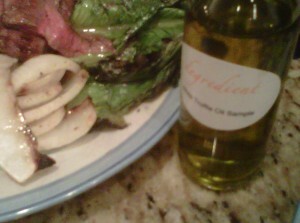 I finished this meal with some white truffle oil from Degredient. A sprinkle of sea salt, a toasted baguette and my wife’s company. Delicious! 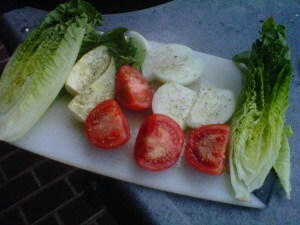 Endive is a good one to grill…..I throw endive, peppers, onions and zucchinis on the grill, lightly char them, and then chop them up and toss them w/ balsamic and good olive oil to make my chopped veggie salad. It’s a great dinner for summer. Yep! 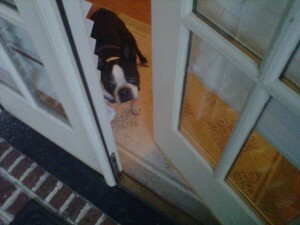 All sounds great Penny, what times is dinner? 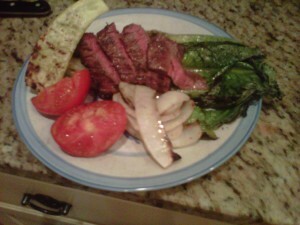 I love grilled lettuce! Will eat it with anything. Yum.